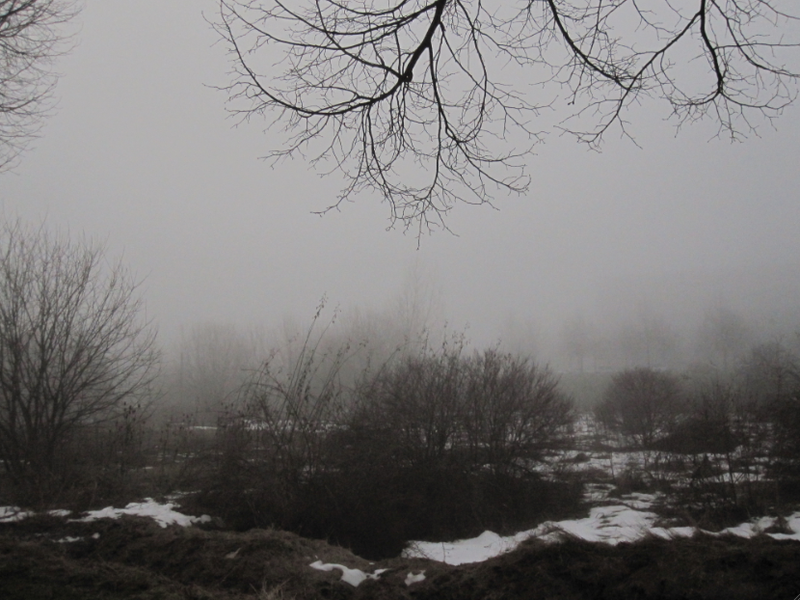 Monday mornings I teach lessons at an office park in Erfurt that always seems to be covered in fog or frost. To get there you have to ride all the way to Europaplatz, the end station on tram lines #1 and #3. 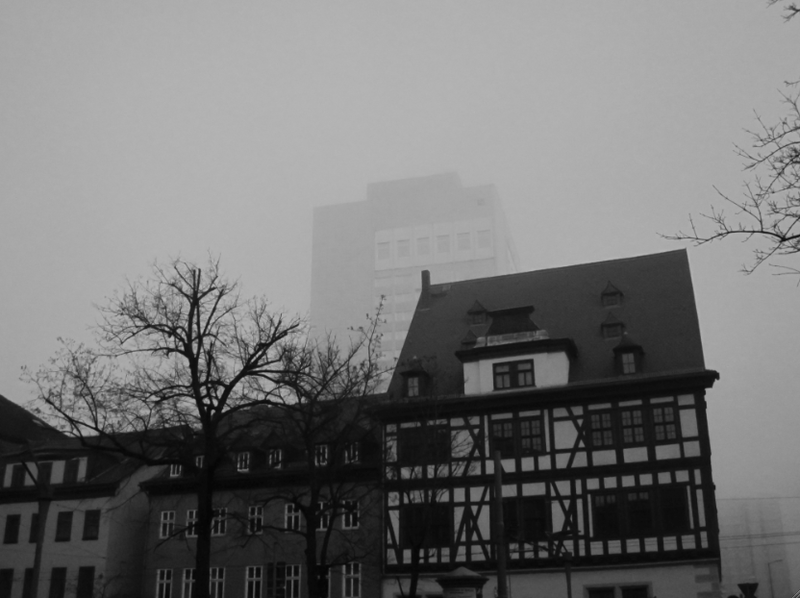 Going to work at an office complex in a foggy valley at the end of a small East German city probably sounds depressing, but I enjoy it. The free coffee helps. And also knowing that even though I start at 8:00 on Monday morning, my work week there lasts only a few hours. Across from the building I work in is a field, and on the other end of that field is a McDonalds. The McDonalds is just off a highway exit and seems fairly inaccessible by foot unless you go crashing directly through the field — a misty, frosted terrain full of burger wrappers and what look like tumbleweeds. I was pretty hungry one day and thought about making the trek, but the idea of stumbling into the foggy wilderness to get to the golden arches seemed too obvious and poignant a symbol for a lost American boy trying to get home. In those conditions the giant “M” might as well have stood for “Mirage.” So, I turned around, caught the tram back into town, and ate at the McDonalds in the central train station instead. On the way there I saw this juxtaposition of buildings — a boxy modern structure behind a timbered house. Not a bad summing up of the architectural coexistence of the middle ages and the DDR. 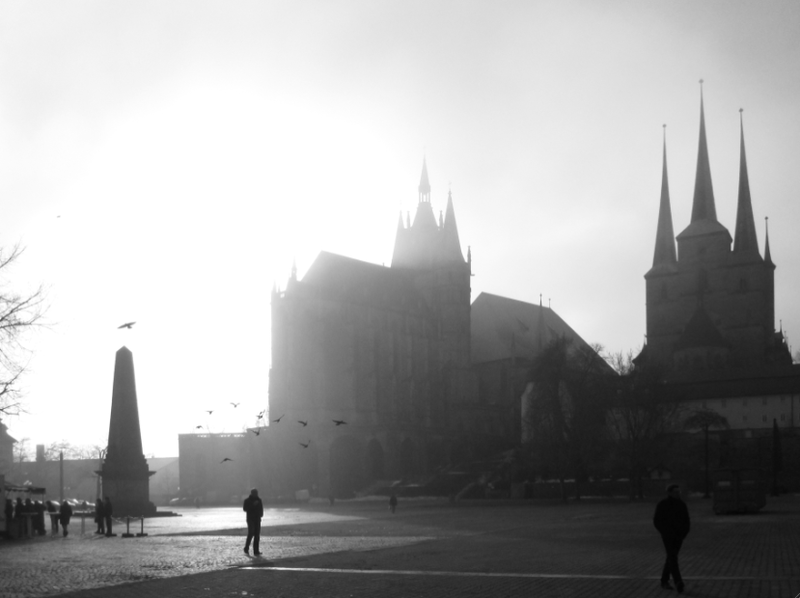 And to close, a more classic shot — the Cathedral Square at a moment of extreme fog and sun, birds flying over the monument and a line of people at the Thüringer Rostbratwurst stand.